A fine and scarce French edition of Louis Evans' highly influential map of the Middle British Colonies, one of the most important maps of the British Colonies to appear in the 18th century. 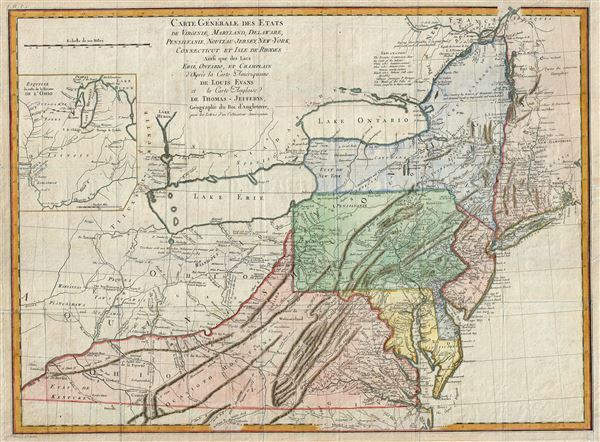 The map covers Louisville on the Ohio River eastward as far as Narragansett Bay and Long Island, northwards as far as Montreal, and south to the mouth of the Chesapeake Bay, inclusive of Lake Erie, Lake Ontario, and most of the Ohio River Valley. A large inset map in the upper left quadrant is entitled, 'Esquis se duresse de la Riviere de l'Ohio,' and details the course of the Ohio River from the Mississippi to Lakes Michigan and Huron. Very good. Slight wear along original fold lines. Blank on verso. Platemark visible.